When my husband Koby and I first applied to be Precious Blood Volunteers, we knew that the year would be hard. I wanted to work at Cristo Rey Kansas City High School, which provides a college preparatory education to low-income and minority students from Kansas City at little to no cost. Growing up in the wealthy suburbs of Chicago and going to college in the middle of nowhere Indiana, I knew the culture change would be a difficult adjustment. And it is. 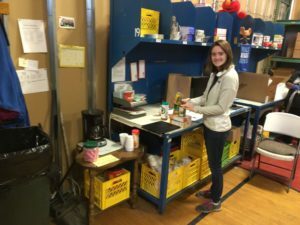 I wanted to do a double placement to get a wider range of experiences here, so I also work at Bishop Sullivan Center, a social services organization that offers a food pantry, free dinners, and rent and utility assistance. Having almost no long-term experience working in social services, I knew learning and adapting to that work would be hard. And it is. Don’t get me wrong – we were very excited about this year and have had a wonderful time. Koby works at KC CARE Health Center, where he loves interacting with patients and helping them learn more about their health. My Cristo Rey kids are wonderful, and I’ve been able to have some great conversations about faith and life with them. 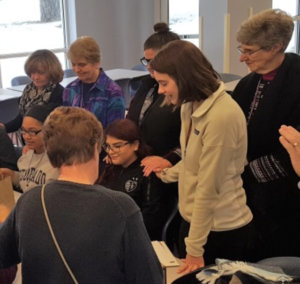 In addition, Bishop Sullivan Center just opened their newly renovated kitchen, which was designed to add dignity and choices to the dining experience. It’s a beautiful new location, and I am honored to be a part of their work. But the year has been difficult – in that good way that means you’re growing. By far the hardest thing about my volunteer year was completely a surprise. I have found it incredibly hard to live eight hours from my family, even though I went to college four hours away and two of my siblings don’t live at home anymore. Because I work at a high school, I had almost two and a half weeks for break, which were spent with our families. It was a wonderful time to reconnect with them, do puzzles with my in-laws, watch cheesy movies with my little sisters, and play games. The time flew by, and then we were headed back to the second half of our year. After driving back from Chicago to Kansas City on the Feast of the Epiphany, I arrived tired, hungry (when you’re on a small stipend, you pack snacks instead of stopping for fast food), and quite homesick. I expected to come into our large community house in the dark, put a frozen pizza in the oven, and scarf it down before running to make 5:00 pm Mass. Maybe later Koby and I would watch Netflix and procrastinate on unpacking. Instead, we pulled up to cars filling the driveway, all the lights of the house on, and a bright party in our living room. Food filled the dining table, which is large, seating 10 people easily, and drinks were moved to the kitchen to make space for even more food, which kept arriving. 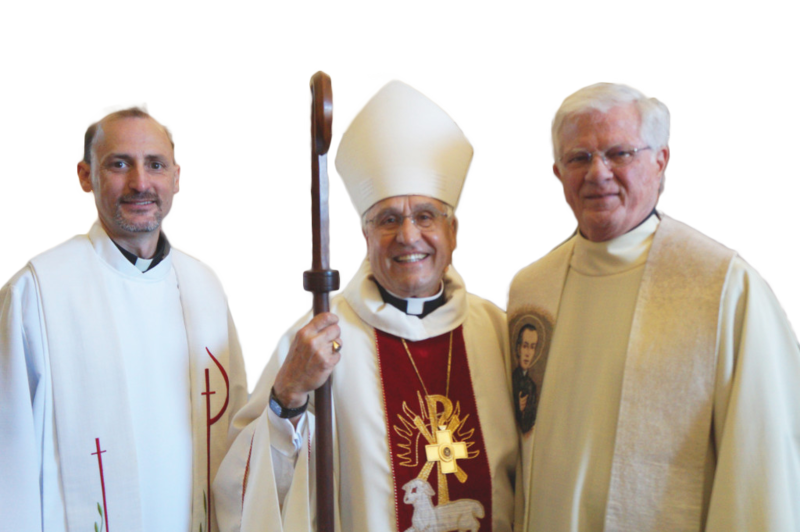 We had forgotten about the annual Gaspar House Epiphany party, held by our community priests and Companions of the Precious Blood. There were tamales, macarons, a King Cake, beer, queso, turkey roll ups, and more kinds of cookies than I could count. All these people, most of whom I had met before, greeted me warmly, asked about the break and Christmas season, and expressed genuine joy to have us there at the party. Some I hadn’t even met before – they had just heard about us through the Precious Blood grapevine. I quickly texted a local friend, who told me about the 8pm Mass at the Cathedral – there was time to spare for the party! And at Mass I ran into another new friend I haven’t seen in some time, reminding me that even though Kansas City can feel lonely, I have many more connections than I often realize. On the Feast of the Epiphany we celebrate the Magi, who traveled from “the east,” following the light of a star to find the baby Jesus. As it would go, Koby and I also came from “the east” (just Chicago and Michigan, but still, east) here to Kansas City. Even now it’s hard to say what light we were following – service, Catholic community, a new experience, a chance to break out on our own, the voice of God calling us to take a risk and trust him, delicious Kansas City BBQ, or maybe all of the above. We were definitely inspired by the work that we would be able to do here, each in our own fields but in a new experience. Even though we had hoped that Koby would go right from college to Medical School, something about this service year just seemed like the right decision. In a way, we followed that light and we came upon Christ incarnate. We had both experienced the presence of Christ here before that – in Koby’s patients, Mass at St. Francis Xavier, prayer with my students, and the people who work at Bishop Sullivan Center– but, for me, I had never experienced that arriving, coming home, being surprised by the presence of Christ here in Kansas City as I experienced it the night of the party. Those who saw us at the party may be surprised to hear this – I was so tired and hungry that I don’t think I was a very merry dinner guest, and we retreated early to unpack – but the feeling that stuck with me all night was one of welcome, love, and community. I imagine it was a little like the Magi felt – traveling so far away from home, away from all their comforts (and a side note: how many snacks can a camel actually carry?). They traveled all that way looking for a new king, and I am quite sure they were surprised by the baby they found, in humble conditions. Did they feel that sense of “Ah, yes, now we have made it”? Were they surprised by Mary’s generosity and hospitality? Did they feel like the journey was worthwhile, and more importantly, that their discovery was worth the journey home, along the back roads to avoid Herod? We can’t answer those questions about them, but for me, the Epiphany Party reminded me of why I originally chose to come out to Kansas City, and showed me that my journey here, and the next six months, would be worthwhile. This Feast of Epiphany, I was surprised by the great light of community surrounding me here, for this time, supporting me, praying for me, and feeding me with Christmas cookies. Brooke is a current Precious Blood Volunteer serving at Cristo Rey Kansas City High School and Bishop Sullivan Center.